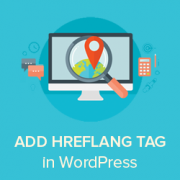 Do you want to add hreflang tags in your WordPress posts and pages? If you publish content in multiple languages or for different regions, then hreflang tag helps you improve SEO for those regions and languages. In this article, we will show you how to easily add hreflang tags in WordPress without writing a single line of code. Hreflang tag allows you to tell search engines which page to show for a particular region and language. You can also use it to define other variations of the same content in different languages. Here is how a hreflang tag implementation looks like in plain HTML. The hreflang tag is a combination of the language code and the region code. For example, en-us for English and the United States, fr-fr for French and France, and so on. WordPress is available in more than 60 languages, and you can use WordPress in your own language. Many WordPress site owners target users in different regions and languages. Some do that by creating multilingual websites, while others do that by offering some content in other languages. Search engines can easily detect the language of a page and automatically match it to the language settings on user’s browser. However, your pages may still be competing with each other in the search results which may affect your site’s SEO. You can implement hreflang tags to fix that. Let’s see how to easily add hreflang tags in WordPress. The best approach to building a multilingual WordPress site is by using a multilingual plugin. A multilingual WordPress plugin allows you to easily create and manage content in multiple languages using the same WordPress core software. These plugins will automatically take care of all technical things such as the hreflang tag, so you can focus on creating content. We recommend using Polylang. It is a free WordPress plugin and comes with a very powerful and easy to use interface to manage multilingual content. For detailed instructions, see our guide on how to how to easily create a multilingual WordPress site. Another popular option is WPML. It is a premium WordPress plugin with an easy to use interface to create multilingual content on your website. For step by step instructions, see our guide on how to create a multilingual WordPress site with WPML. After you have created some posts or pages in multiple languages, you need to visit them in a new browser window. Right click and select ‘View Page Source’ from your browser menu. This will open the source code of the post or page. Now you need to look for hreflang tag to verify that it is working properly. You can also use CTRL+F (Command+F) keys to find the hreflang tag. This method is for users who are not using a multilingual plugin to manage translations on their websites. 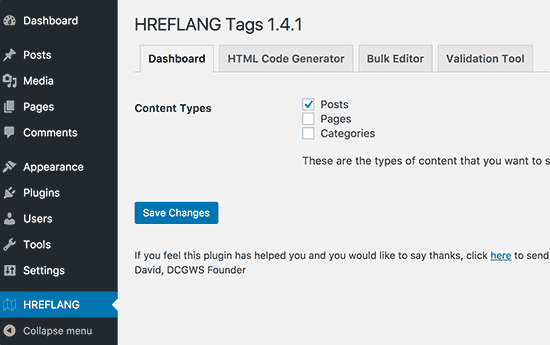 First thing you need to do is install and activate the HREFLANG Tags Lite plugin. For more details, see our step by step guide on how to install a WordPress plugin. Upon activation, the plugin will add a new menu item labeled HREFLANG in your WordPress admin menu. Clicking on it will take you to the plugin’s settings page. Select the post types where you’d like to enable the plugin and then click on the save changes button to save your settings. Next, you need to edit the post or page where you want to add the hreflang tag. On the post edit screen, you will notice a new metabox labeled HREFLANG tags. First you need to add the URL of the post that you are currently editing and then select its language. After that you need to click on the plus button to add URLs of other variations of the post and their language. Once you are done, click on save or update button to save your post. You can now visit your post in a browser window and view its source code. You will see the hreflang tag added to your post. 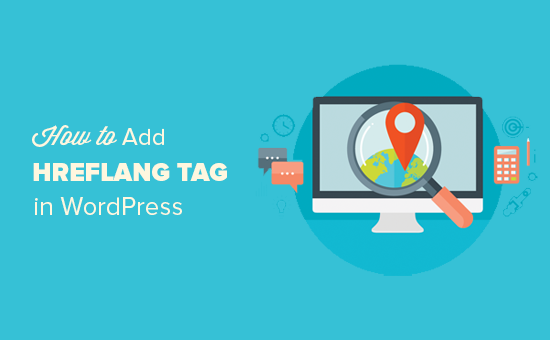 We hope this article helped you learn how to easily add hreflang tag to your WordPress site. You may also want to see our step by step WordPress SEO guide for beginners. 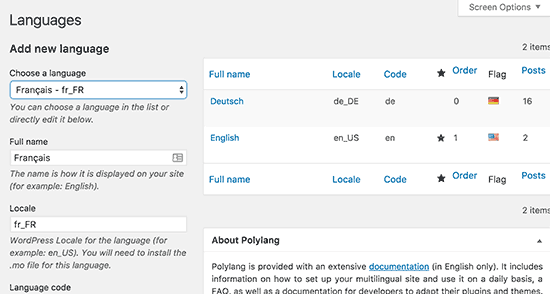 you can set up the language on the WordPress setting page. Correct, the hreflang tag is for if you use more than one language on your site. Can we use hreflang code on a large site which has been targeting more than 80 regions? does it not increase the website load time? I have been trying to add this hreflang tags in my site. But after adding the tags for a particular targetting country. Its still showing the “en-un” return error. How to solve this in Google Search Console? I am working on a multilingual website. How many lagnuages i can target at once? My domain ends with .pk. Should i insert the following in header.php of my theme? If not, what i should do then? If you are only writing for one language or region you can ignore the “no hreflang tags” message. That message will appear automatially, but just ignore it. My site is only targeting Germany speaking countries, and only in Germany language, so what should I do ? Please help me, very urgent! Yes it will show ” No hreflang ” because you using online single language (Germany) on your website. If you want to target other countries then you have to make settings as mention up on this blog. So it will show in other language to target other country people. But as you said you just want to target German people then don’t consider hreflang and move forward. Does the default lang=”en-us” have SEO factor that google will consider it to display more to USA visitors and less to other countries? Hi, I’m not targeting a particular country, do I still need to implement hreflang? If I have a post on a .com site that I want to target to en-au audience, do I need to have an en-us version also? What I mean is, can I have some posts on my site targeting US visitors and others targeting Aus visitors without duplicating them? Suppose I have .com domain and i want to target it to countries like us, uk , canada, australia etc. If i created sub directory like example.com/us, example.com/in etc so to target specific countries do i need to install wordpress in each subdirectory ? ? ? I wanna know if my site only one language, did I need to input this Hreflang Tags? If you are only targeting one single language is there an SEO benefit for doing a Hreflang Tag or can it just be left unset? what about codes?? nice functions of wordpress are not enought? An informative post on hreflang attribute. I am trying to implement it from a long time. But for example, if I want to have 3 different pages for the same language but different country like en-gb, en-us, en-au, how do I proceed? As described in the article you can select them as hreflang in a multilingual plugin or hreflang tags lite plugin.